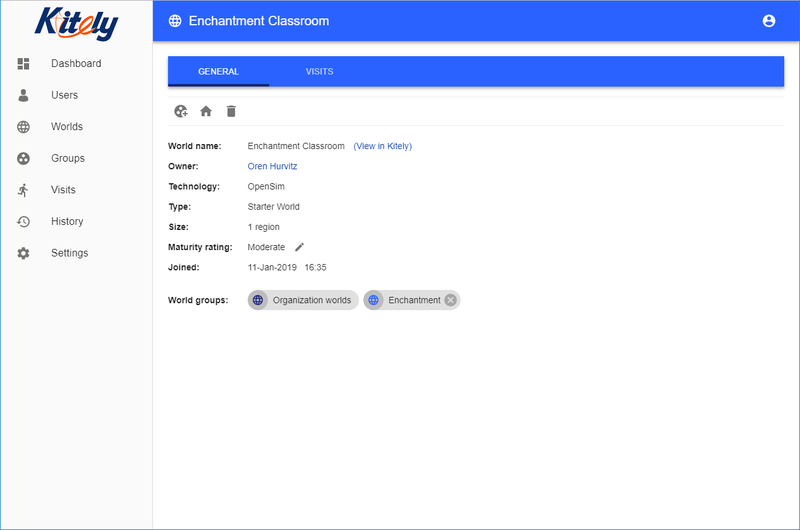 Organizations enable you to create and manage your own users, with precise control over which worlds they can visit and what they can do in-world. 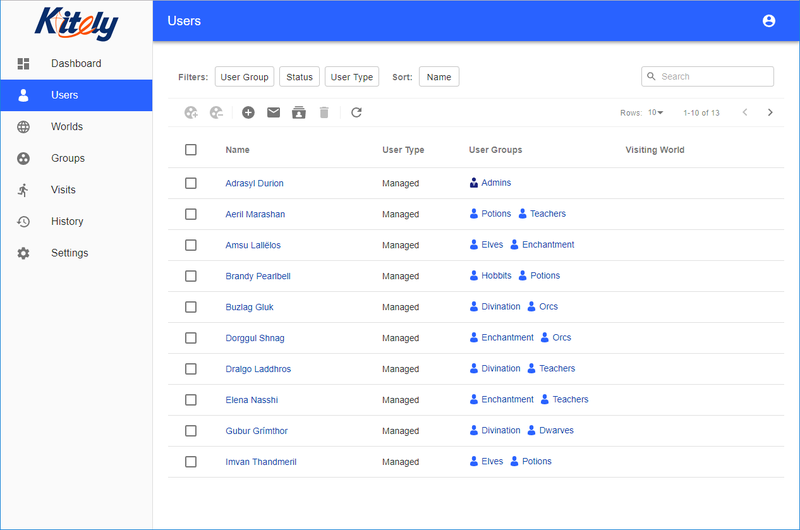 They provide administrative capabilities that enable you to manage groups of users and worlds with unprecedented ease. Starter Organizations – can have up to 100 users and 10 worlds, for $49.95/month. Standard Organizations – can have up to 400 users and 40 worlds, for $99.95/month. This type of organization can use advanced features that aren’t available to Starter Organizations. Custom Organizations – contact us to discuss your needs if they aren’t met by our Standard Organizations. This option can include custom features. The prices listed above include the Organization and its users, but not the worlds that you manage using the Organization. Those have to be paid for separately. Some organizations (e.g., schools) aren’t active year-round. To save on costs, we allow Organizations to be Stored. A Stored Organization is disabled, and its price is reduced by 50%. This reduced price is paid daily, using KC, until the account is switched back to active mode. The Settings page has a new section called “Organizations (Virtual Grids)”. 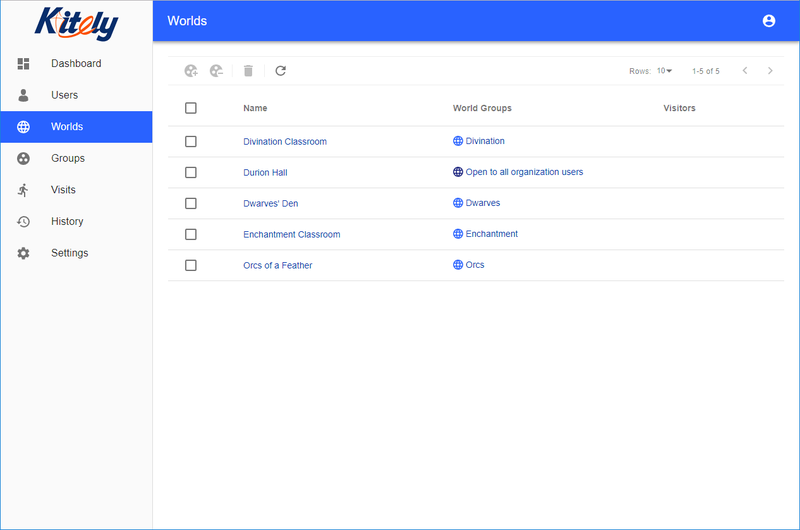 This section lets you create an Organization. An Organization has a Name and a Short Name. The Short Name is used in the Organization’s domain names: its Management Website and Grid URI. The Kitely user that creates the Organization becomes its owner. The owner pays for the Organization, and if the owner’s account is deleted then the Organization is also deleted. Therefore, if you’re creating an Organization that matches a real-world organization such as a school or a company then consider creating a special Kitely user just to own the Organization. 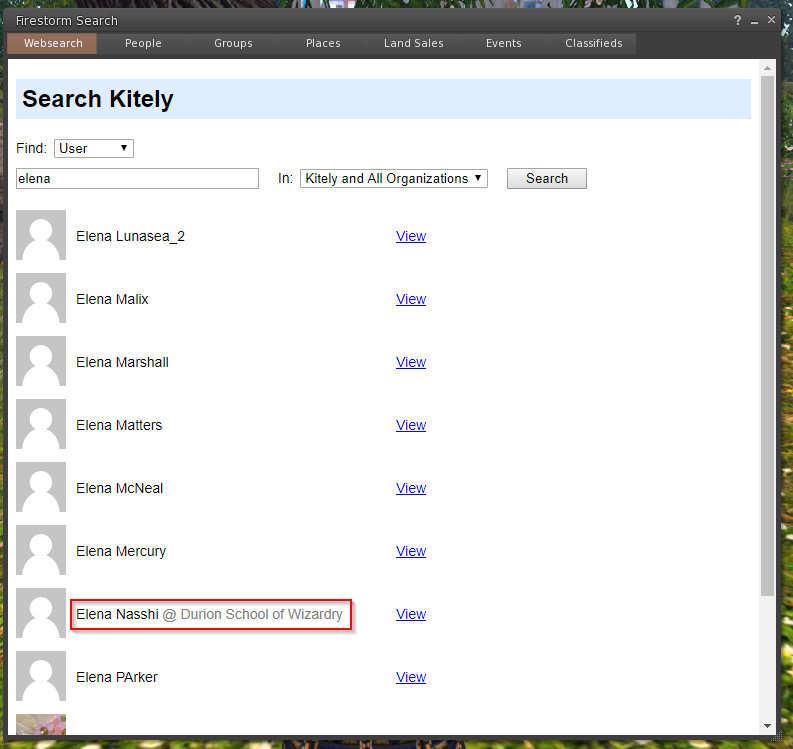 This way, if you leave the real-world organization then you can transfer control of this Kitely user to a co-worker. Private Virtual Grid – a private grid that runs inside Kitely. This is a “Virtual” grid because it uses the same servers as the main Kitely grid. But it has its own Grid URI, and the Admins can control who may visit the grid’s (Organization’s) worlds. Managed Users – users that are created by the Organization. The Organization Admins have full control over these users. Managed Users can’t login to the main Kitely website. Independent Users – regular Kitely users who have agreed to join the Organization. The Admins only control what Independent Users do when they’re visiting the Organization’s worlds. However, the Admins can’t control what Independent Users do outside the Organization. Typically, an Organization will have only a handful of Independent Users, and many Managed Users. An Organization probably has a list of students/employees that should be given access to the Organization, and one of the Admins will create accounts for all of these users. To make this process easier, you can create multiple Managed Users at once by uploading their details in a CSV file. This process is called Batch Create Users. To add Independent Users, Admins send them an invitation by email. If the invited user clicks on the link in the invitation then they become a member of the Organization. Independent Users can be members of an unlimited number of Organizations, and they can cancel those memberships from the Settings page in their Kitely account. You can optionally set one of the Organization’s worlds as the Default World. This world should be open to visits from all of the users in the Organization. When users login to your Organization’s virtual grid for the first time (without specifying which world they want to visit), they enter the Default World. Users also enter the Default World if they try to visit a world that has been deleted, or that they don’t have permission to visit. In addition, anyone that tries to teleport to your Organization’s Grid URI without specifying a world will enter the Default World (assuming they have permission to visit it, of course). Users and worlds belong to Groups. 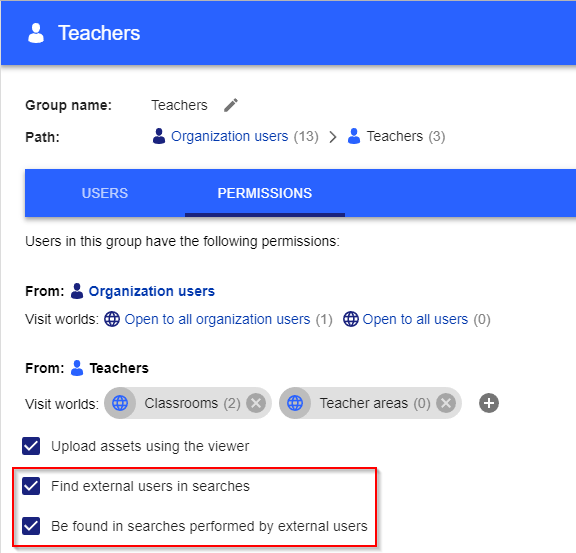 Permissions are assigned to User Groups. 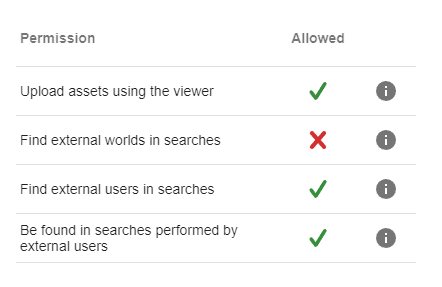 These permissions determine which worlds the users can visit, and whether they’re allowed to upload assets. 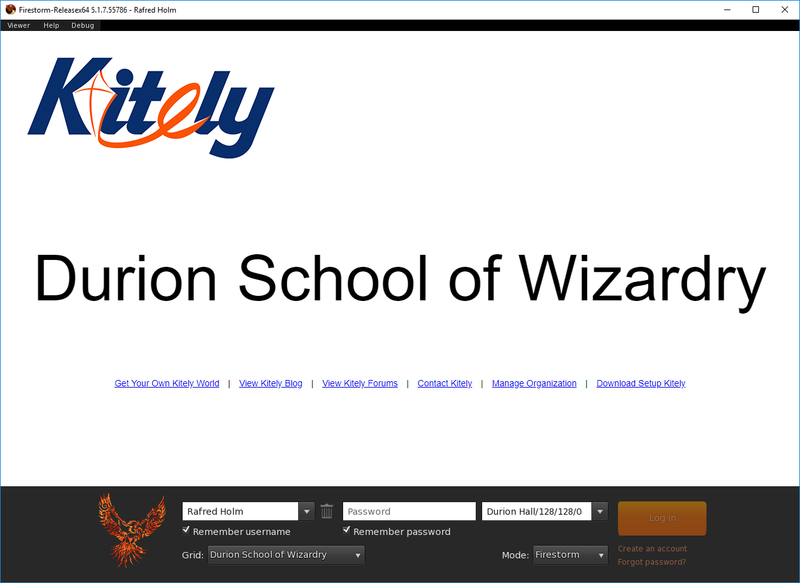 For example, consider a school called the “Durion School of Wizardry”. The school offers three courses: Divination, Enchantment and Potions. 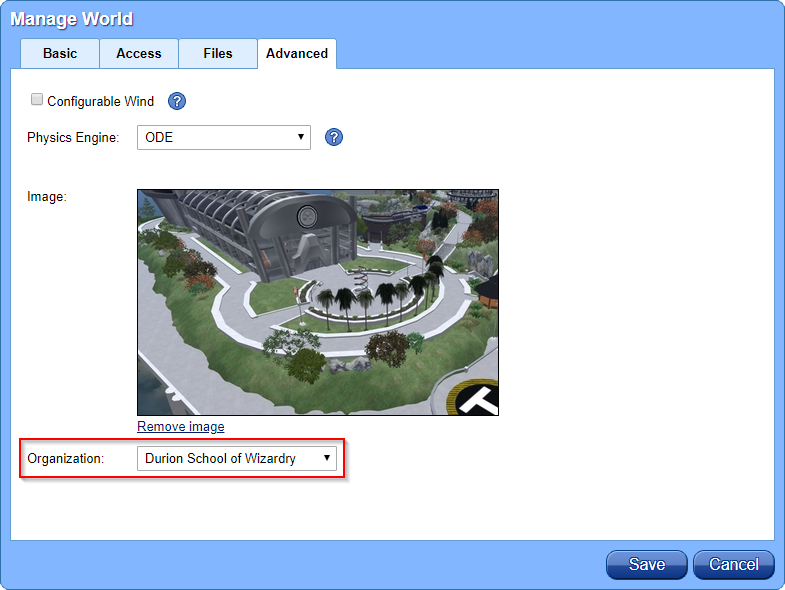 Only students that are enrolled in a course are allowed to visit the course’s classrooms (virtual worlds). Create three User Groups: Divination, Enchantment and Potions. Add the users that are enrolled in each course to the corresponding User Group. Create three World Groups, also called Divination, Enchantment and Potions. The World Groups contain the worlds that are used to teach each of the courses. 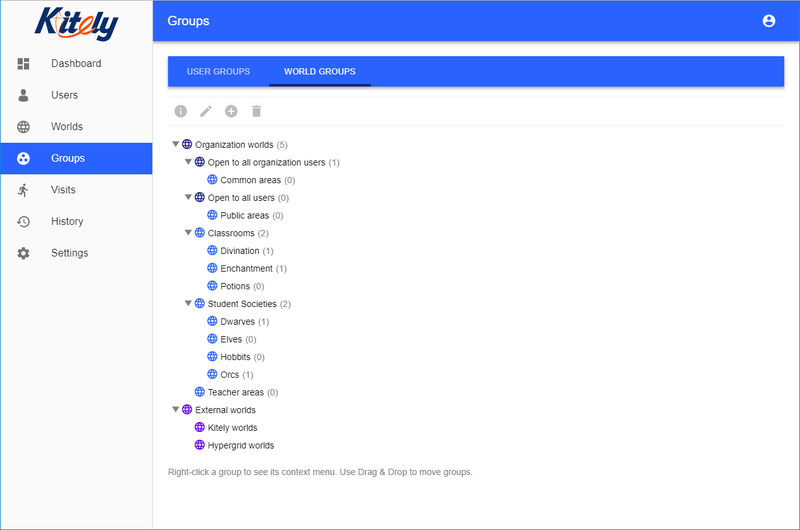 Give each User Group permission to visit the corresponding World Group. The number in parentheses after each User Group is the number of users in that Group. The number in parentheses after each World Group is the number of worlds in that Group. The permissions in this screenshot show that users that belong to the “Divination” User Group are allowed to visit worlds in the “Divination” World Group. However, they’re not allowed to upload assets. 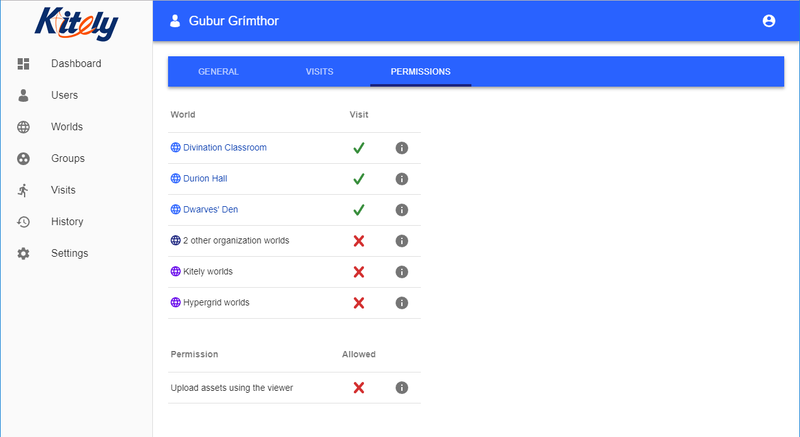 If you want to verify that you’ve set the permissions correctly then choose any user and view their permissions. This shows you which worlds they can visit. You can also click on the “i” icon to see an explanation of why they have (or don’t have) the specified permission. 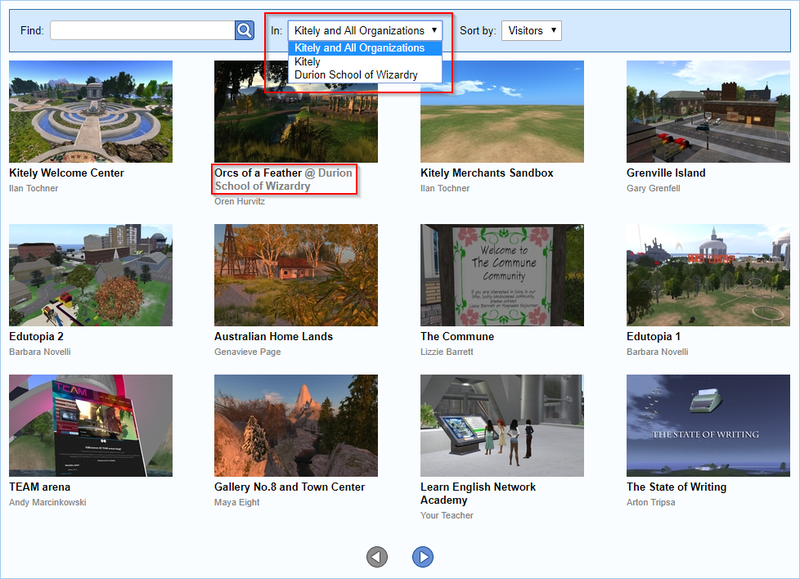 Because Organizations are Virtual Grids inside Kitely, external users (users that don’t belong to the Organization) can visit the Organization’s worlds directly (without having to use the Hypergrid). However, you control which worlds (if any) external users can visit. You do this by giving (or withholding) permission for the “External Users” group to visit your worlds. 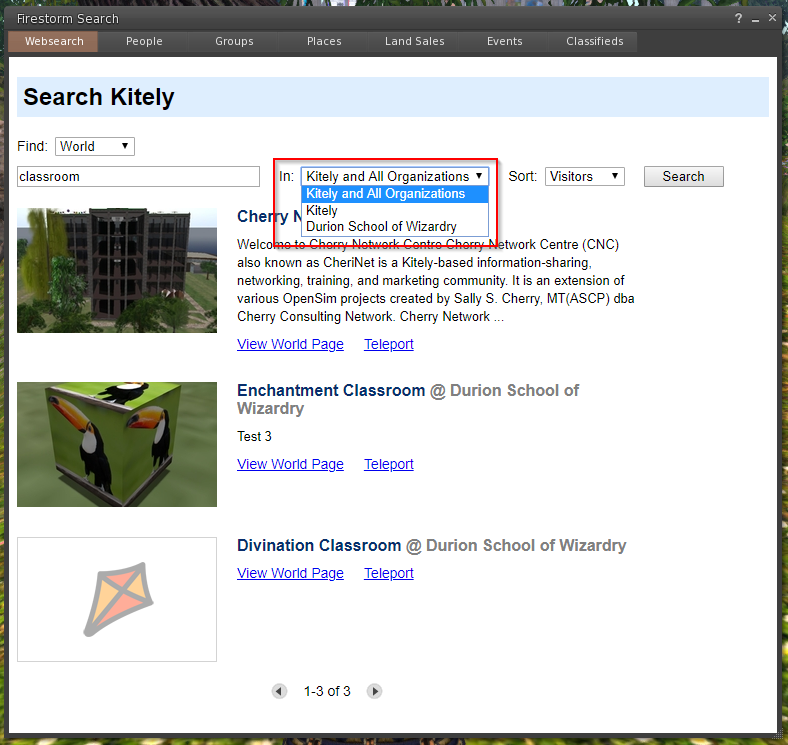 Likewise, your Managed Users can visit external worlds in Kitely without having to use the Hypergrid. But again, you choose whether to allow this, by giving (or withholding) permission for your users to visit worlds in the “External Worlds” group. Note that if you do allow your users to visit External Worlds then they can visit any external world: you can’t control precisely which external worlds they can visit. Finally, you can choose to allow (or prevent) Hypergrid users to visit your Organization, and/or for your Managed Users to visit worlds in the Hypergrid. 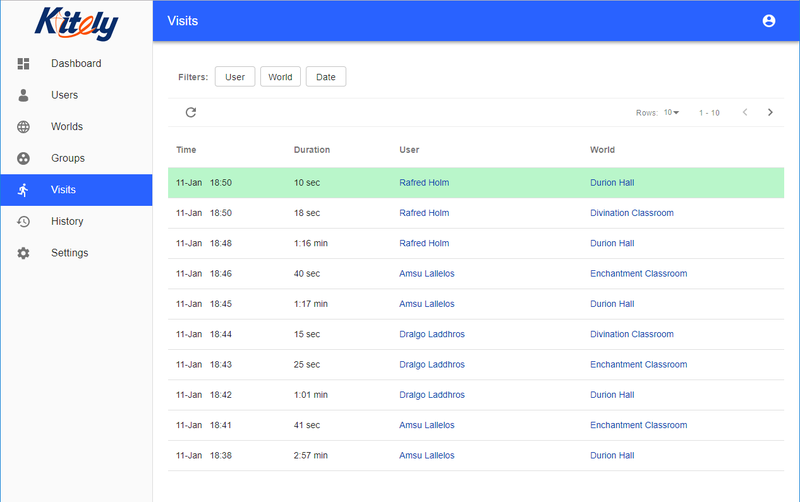 You can view every world visit made in your Organization in the Visits page. 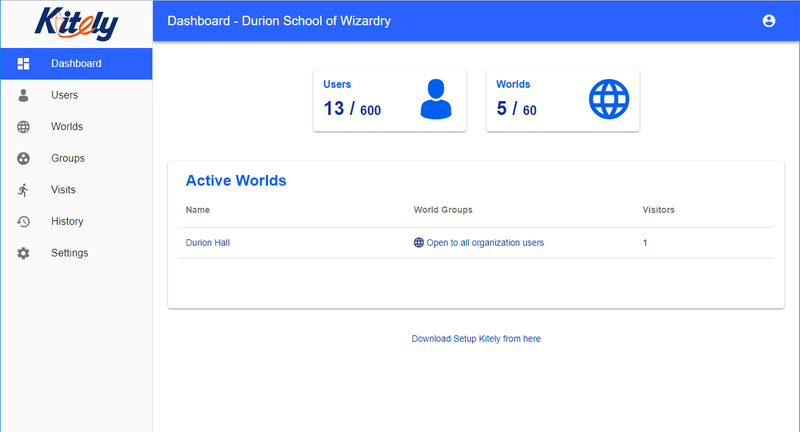 This includes visits made to your Organization’s worlds (even visits by external users), and all visits made by your Managed Users (even visits to external worlds in Kitely, but not visits to Hypergrid regions outside Kitely). Visits that are currently active are highlighted. 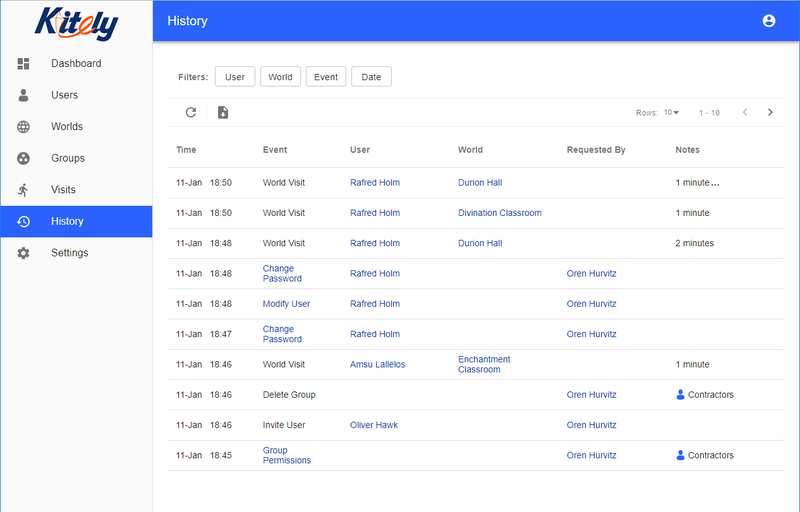 You can view a detailed list of changes that were made to the Organization in the History page. Many of the history events can be clicked to get additional information. If your Organization has multiple Admins then there will likely be times when you’ll want to know who made changes to your Organization. This information is shown in the “Requested By” column. You can export the History table to a CSV file. 7 avatars that are identical to the default Kitely avatars. These avatars can change all of their clothes, including their underwear. 6 avatars that have a similar visual style to the Kitely avatars, but have underwear that is part of their skin layer (so they can’t get fully naked by taking off all their clothes). The picture button lets you upload an image for the avatar: this is the image that your users see when they choose their avatar. The arrow buttons change the order in which the avatars appear. You can add your own custom avatars to this list by copying the current appearance of your own avatar, or that of any of the Organization’s Managed Users. You can’t copy the appearance of any Independent User, however (except yourself). Setup Kitely is a program whose purpose is to help the Organization’s users, who might never have heard of OpenSim, visit the Organization’s worlds for the first time. Setup Kitely runs on Windows and Mac computers. 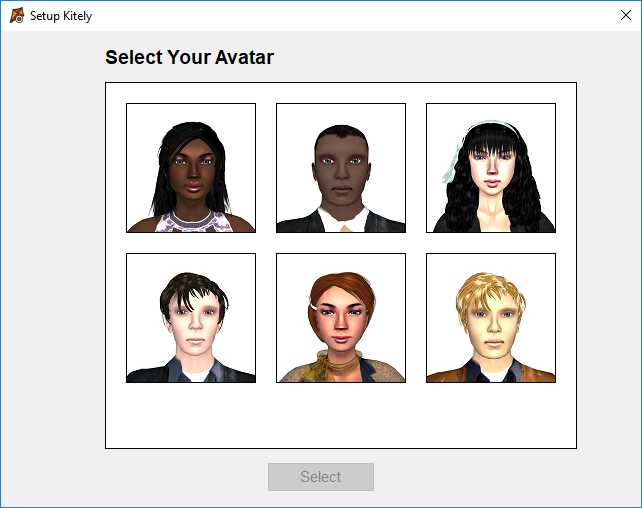 It helps the users download the correct version of Firestorm for their computer; add your Organization’s Virtual Grid to Firestorm; choose their avatar; and enter one of the Organization’s worlds. Setup Kitely’s ability to add your Virtual Grid to Firestorm is particularly useful, because adding grids is a highly technical operation that many people, especially ones new to OpenSim, encounter problems with. Learn more about Setup Kitely here. Regular Kitely users (that don’t belong to an Organization) can also run Setup Kitely, but its only benefit is to change their avatar to one of the default avatars that we offer. Since Organizations are Virtual Grids inside Kitely, you can use non-exportable items from Kitely Market in the Organization’s worlds and avatars. Managed Users can’t use Kitely Market because they can’t login to the main Kitely website. So if you want a Managed User to get items from Kitely Market then one of the organization’s Independent Users will have to buy the items themselves, and deliver them to the Managed User from Kitely Market as a gift. While Kitely Organizations already provide you with many advanced tools for managing a virtual grid, this is just the initial launch of the service. We consider this new offering to be an important part of our future business and will continue adding many features to it in the foreseeable future. If you encounter any issue with our service, want to give us feedback about it, or have followup questions then please let us know in our forums. The GDPR requires active consent in order to send any non-critical emails, so we had to disable all of the optional emails that we used to send to you. This includes highly useful emails such as ones notifying you when another user sends you a message. 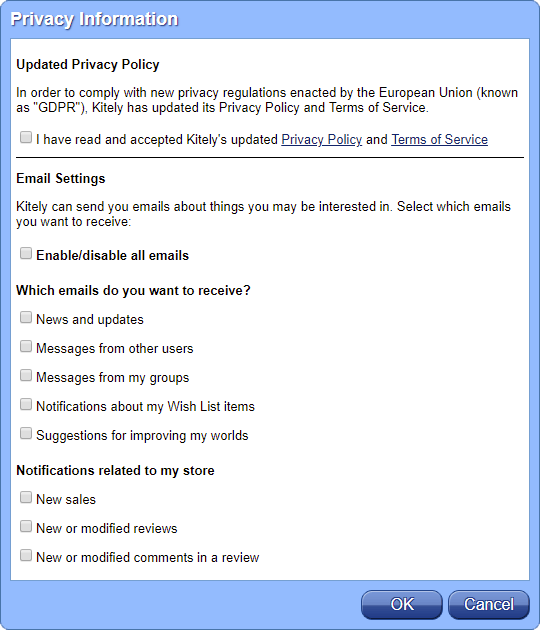 If you have a Kitely Market store then you will also no longer receive an email when that store makes a sale. You need to opt-in if you want to receive these emails again. After they accept our Terms of Service they’ll be able to visit the Kitely grid without having to repeat this approval process. The GDPR limits our ability to sign up users who are under 16 years old. We’re now required to obtain the consent of the parent or guardian of such users before we allow them to use our service. 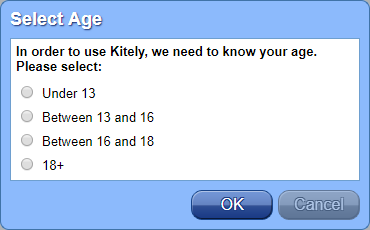 Until now, Kitely didn’t require you to specify your age (only to assert that you’re over 13 years old). We only asked for your age if you tried to change your account’s Maturity Rating to Adult. In order to comply with the GDPR, we now require all of our users to specify their age range. If you provided us with your date of birth in the past then we have converted it into an age range, and deleted your exact date of birth. We’ll send an email to the parent or guardian, asking them to approve your account. Once they do so you’ll be able to create a Kitely account (or continue using your existing account). 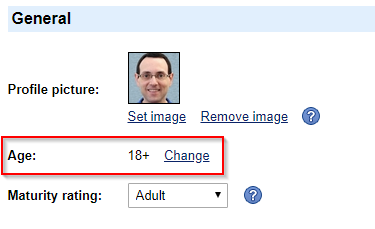 You can view and change your age range in the account Settings page. However, if you’re under 16 years old then we’ll ask your parent or guardian to approve the new age range that you choose. Account name – this is the name that appears in the Kitely website (e.g., in the Account History page and in the forums). It’s the name that you chose when you signed up to Kitely. OpenSim avatar – how you appear in OpenSim. This name is usually the same as the Account name, but sometimes it’s slightly different. In the past you were only able to choose your Account Name, and only when you created your account. We then generated your OpenSim Avatar name automatically based on your Account Name. Usually these names are the same, but sometimes we have to make the OpenSim name different from your Account name. This can happen for several reasons: e.g. because your name is already in use in our OpenSim grid (which doesn’t allow two avatars to have the same name), or because your Account Name contains characters that are unsupported in OpenSim. This can cause some users to have OpenSim names like “John Smith_2”. 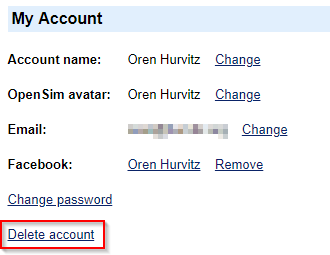 If you wish, you can now change your OpenSim Avatar name. We strongly recommend that you make your Account Name and OpenSim Avatar Name identical, or at least as similar as possible. Otherwise things will get very confusing, as you’ll be known by different names in our OpenSim grid and on our website (which includes the forums). 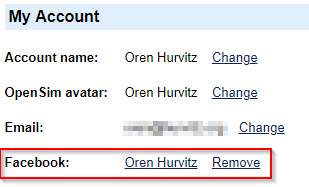 One last warning: if you change your OpenSim Avatar name then you might not see the results of the change until you clear your viewer cache. Similarly, other users who meet you in OpenSim will also see you using the old name, unless they also clear their viewer’s cache. So you should think carefully before you change your OpenSim name. For security, you’ll need to enter your password in order to change your email address. We’ll send a verification email to the new email address, and a notification email to your old address. If you created your Kitely account using Facebook or Twitter (instead of using an email and password), then you can now view and delete your link to these services. If you remove your link to Facebook or Twitter then you’ll be able to login to Kitely using your email and password instead. You will need to confirm that you want to delete your account by first entering your password, and then by clicking on a confirmation email that we’ll send to your email address. Once you do this your account will be deleted immediately. All of your Kitely worlds will be deleted, and if you have a Kitely Market store then it will also be deleted. We keep some information about your account even after you delete it. We need this information for security, so that bad people don’t come into Kitely; wreak havoc; and then quickly erase all the traces that can help us identify them. This retained information will be removed from our system 30 days after you delete your account. After that, some information may still exist in our backups, but even that information will be deleted within 90 days. Information relating to your PayPal and Kitely Credits transactions will be stored indefinitely, even if you delete your account, in order to comply with anti-money laundering regulations and accounting regulations. 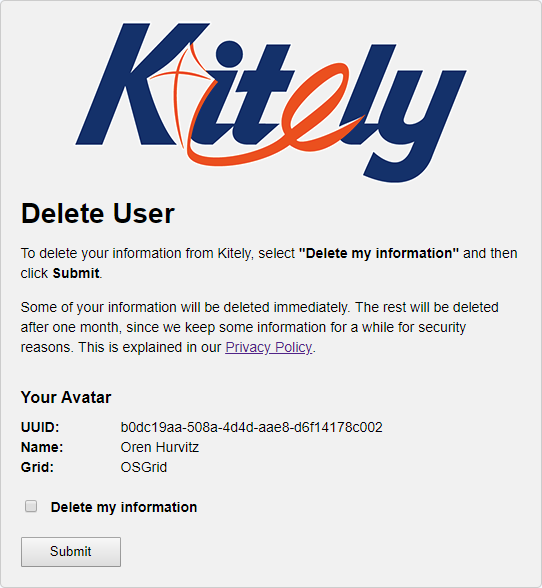 Hypergrid users also have the option to delete their information from Kitely. Since Hypergrid users don’t have a Kitely account, they can’t go to their Settings page to delete themselves (as Kitely users do). Instead, we’ve added a sign in the Kitely Welcome Center that enables Hypergrid users to delete their information. This sign is located in the information kiosk area (hop://grid.kitely.com:8002/Kitely Welcome Center/63/127/25). We updated our system today with several privacy-related improvements. 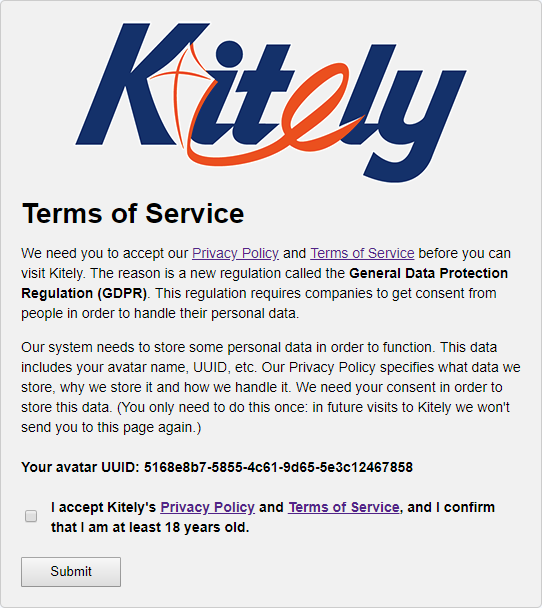 We’re working to make Kitely compliant with the upcoming General Data Protection Regulation (GDPR). This is a wide-ranging privacy law enacted by the European Union. Many of the changes we’re making are behind the scenes, but some are user-visible, and one of these changes is included in today’s update. We now provide you with more control over which emails we send you. The Settings page now contains an “Email Settings” section where you can opt in or out of all types of emails. 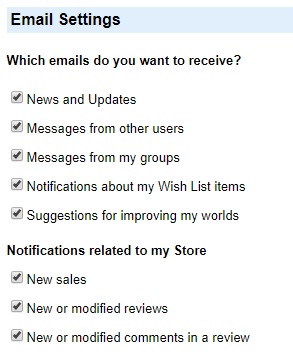 If you have a Kitely Market store then the Settings page will also show you Store-related email settings. These settings were moved here from the Store page. We will implement other GDPR-related changes in future releases. 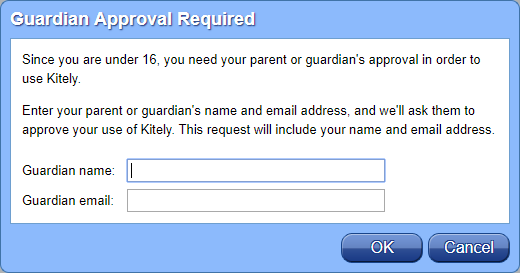 For users who created their Kitely account using Facebook or Twitter, we used to provide the ability to restrict access to their worlds to users who are their Facebook Friends; Twitter Followers; or in one of their Twitter Lists. This feature has now been removed. It was very rarely used, and it has become difficult to enable due to Facebook’s and Twitter’s recent privacy-related changes. You can still restrict access to your Kitely world by selecting OpenSim groups whose members will be allowed to enter the world. To do so, go to the Access tab in the world’s Manage World dialog. We’ve made it easier for Kitely Market merchants to redeliver a product to many customers. When merchants update a product, they sometimes want to redeliver it to all of the customers who had previously purchased the product. But these deliveries can fail if the destination grid is down. We show an error message when that happens, but until now that message didn’t specify which customer failed to receive the item. This is a problem when delivering to many users at once. We’ve now improved this error message to show which item and customer failed to receive the redelivery. We updated our system today with a couple of features that were requested by Kitely Market merchants. It’s now possible to easily deliver product updates to all the people who had purchased them in the past. We also added a feature that allows users of grids that had shut down to regain access to their Kitely Market purchases. 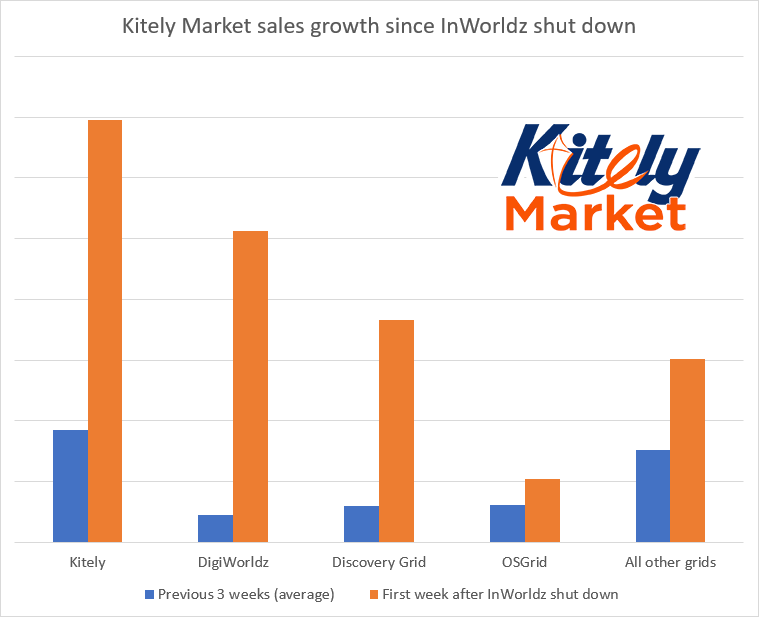 Kitely Market merchants often make tweaks and improvements to their products even after they’ve been released. They’ve told us that they would like to have an easy way to deliver the new version of their products to all the people that had bought them in the past. This is now possible using a feature called “Batch Redeliver”. This feature allows Kitely Market merchants to select orders that were originally delivered to another grid, and redeliver them to Kitely avatars. This feature is intended to be used when a grid shuts down. When that happens the grid’s users lose their inventory, including their Kitely Market purchases. By using this feature the merchant enables their customers to get back their Kitely Market purchases, using their Kitely avatar. Kitely Market has been used to deliver orders to hundreds of OpenSim grids. Since dozens of grids shut down each month, this feature can be very useful for merchants that have customers from a grid that no longer exists. It is completely up to the merchant to decide whether to use this feature or not. They might use it if they’re contacted by someone who had an avatar on the now closed grid, and transfer only that avatar’s orders. Alternatively, if a merchant hears that a grid has closed, they might decide to transfer all of the purchases that were delivered to any avatar on that grid. Lastly, the merchant can decide that they would rather handle such cases in other ways and not use this feature at all. 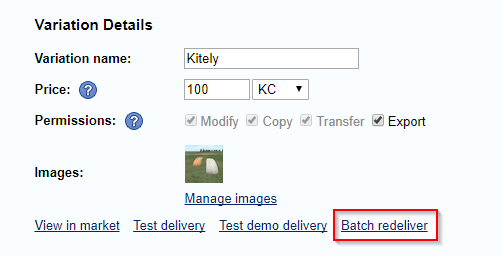 This feature is described in detail here: Transfer Hypergrid Orders to Kitely. In the Kitely Market Sales History page, it’s now possible to search for orders by entering the name of the avatar that received the purchase. Until now it was only possible to search using the name of the user that bought the order. 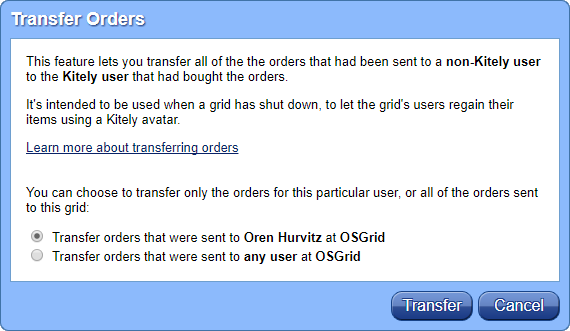 Usually the user that buys the order is also the receiving avatar, but they’re different in the case of Gifts, or when the order is delivered to an avatar on another grid. We fixed a bug that caused a few fonts to stop working in OpenSim. The affected fonts were the Microsoft ClearType fonts, including Cambria and Calibri. We’ve updated our system today with several improvements that were requested by our users. Among other things, we’ve made it easier to use the wish lists in Kitely Market, and to add Demo items to Kitely Market product listings. It’s now easier to buy items that are in your Wish List. The Wish List contains a “Buy” link next to each item. Previously, clicking this link would switch to the Shopping Cart, where the item would appear. This made it cumbersome to add multiple items from your Wish List to the Shopping Cart, because you’d have to flip back and forth between these two pages for each item. Now, clicking “Buy” adds the selected item to the Shopping Cart but doesn’t switch to the Shopping Cart page. This makes it much faster to buy multiple items from the Wish List. Kitely Market has built-in support for adding Demos to product listings. Previously this feature required a lot of work from content creators, because they had to create a Demo item for each of the product’s variations. Products in Kitely Market often have many variations, so this quickly became tedious. It was also mostly unnecessary, since usually a product only needs one Demo, regardless of how many variations it has. For example, even if a dress is available in 8 colors, it’s often enough to provide a demo in only one color. To address this issue, we’ve now changed Kitely Market so that if a product has any Demo, in any of its variations, then that Demo can be used by all of the variations. This eliminates the need to create multiple Demos for the product. If that doesn’t exist: a Demo from the nearest previous variation in the Variations table. If that doesn’t exist either: a Demo from the nearest succeeding variation in the Variations table. If none of the above exist then the product has no Demo. Kitely Market has built-in tools for finding and fixing problems in products. When content creators add a product to Kitely Market, we check their product and show warnings if it contains references to non-existing assets. However, sometimes these references are for standard predefined OpenSim asset identifiers. These predefined identifiers aren’t regular assets, but they’re not missing, and therefore shouldn’t cause our system to display warnings. We maintain a list of such assets, and we’ve now added several additional asset identifiers to that list to eliminate a few incorrect warnings that our system had previously displayed. To learn more, see this list of our supported OSSL functions. We’ve switched to using llCastRay v3, which provides more accurate results than llCastRay v2. We upgraded to using a newer version of OpenSim 0.8.2.1. This update contains a few minor changes that only affect the backend, and no user-visible changes.